Samuel Smith's pub near Westminster Cathedral, located on the corner of Windsor Place and Francis Street. 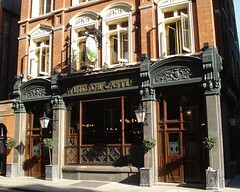 Previously known as the Cardinal photo, it closed for refurbishment in 2010 and was renamed to the Windsor Castle when it reopened in mid-2011; this is a name it has had before. There are several compartments towards the front, some with mostly/only high tables and stools. Signs warn that drinking outside on the pavement is not permitted. At the back is a large, open room in the style of a gentleman's club. A large rectangular stained-glass skylight is centered in the ceiling, and a large ornate mirror stands above the fireplace. The walls are half-panelled in dark wood, papered above in subtly-patterned burgundy, and adorned with framed paintings of the interior of the actual Windsor Castle. Sofas and armchairs cluster around claw-footed tables. There are four handpumps on the bar, presumably all clipped for Sam Smith's sole cask offering, Old Brewery Bitter (which was £1.36/half and served a bit cold on Kake's March 2012 visit). As of April 2015, food is served noon-9pm. Accessibility: Step-free to get in at the left-hand entrance; the right-hand entrance has a very small step. There's step-free access to a RADAR-locked toilet via the back room, though there's a very heavy (non-RADAR-locked) door in front of it. A RADAR key is available from the bar. The gents' toilets are down a flight of stairs in the basement, and the ladies' are up half a dozen stairs (there may be another ladies' somewhere — this one was a single tiny cubicle). Last edited 2015-04-26 13:25:47 (version 12; diff). List all versions. Page last edited 2015-04-26 13:25:47 (version 12).